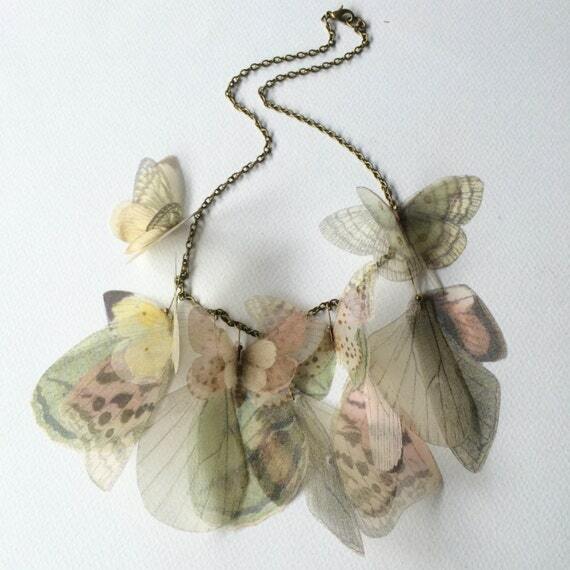 Completely hand-made necklace, with silk organza butterflies and wings. I chose butterfly wings images one by one, from real pictures and vintage illustrations. Then I printed them on high quality silk organza, cut and fixed on antique bronze chain. There are about 22 butterflies (and wings) on this necklace, and each one measure from 3 to 10 cm. Pastel colors: ivory, yellow, pale pink, pale green and a little bit of pale grey. Antique bronze chain, with lobster clasp, is long about 45 cm. 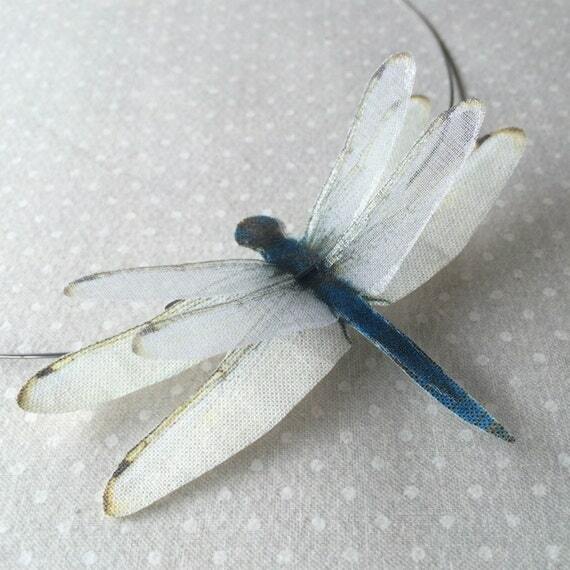 Completely hand-made earrings, with silk organza blue dragonfly and wings. I chose dragonfly and wings images one by one, from real pictures and vintage illustrations. 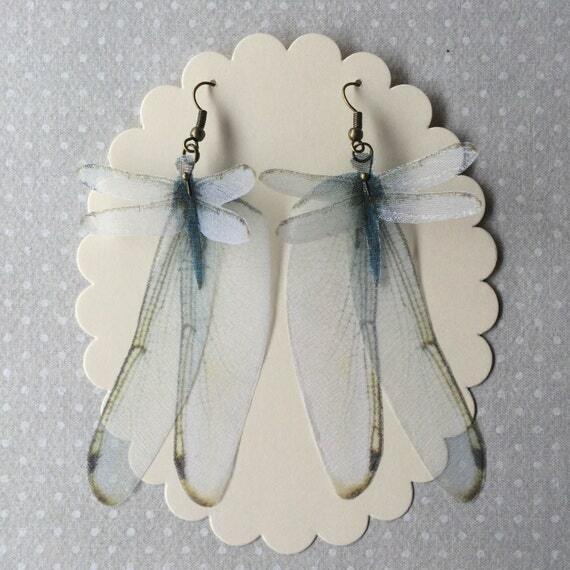 There are 2 dragonflies and 4 wings on these earrings and they measure about 9 x 5 cm. Antique silver heavy duty wire with handmade clasp. In pictures I show a SMALL size. Completely hand-made earrings, with cotton BIO and silk organza butterflies. 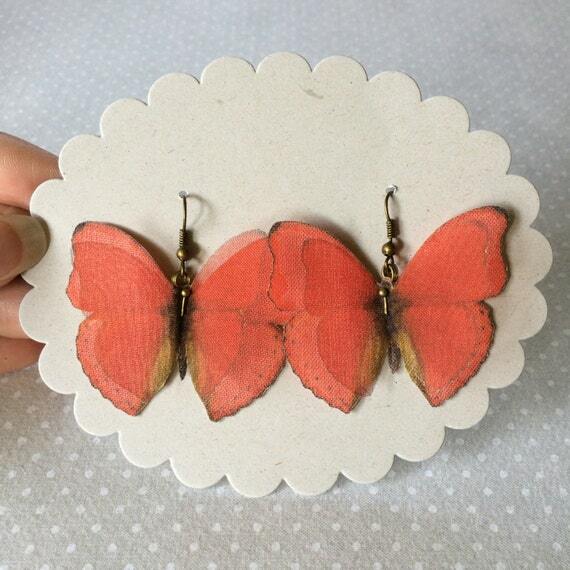 There are 4 butterflies on these earrings and they measure about 5 cm. (wingspan). 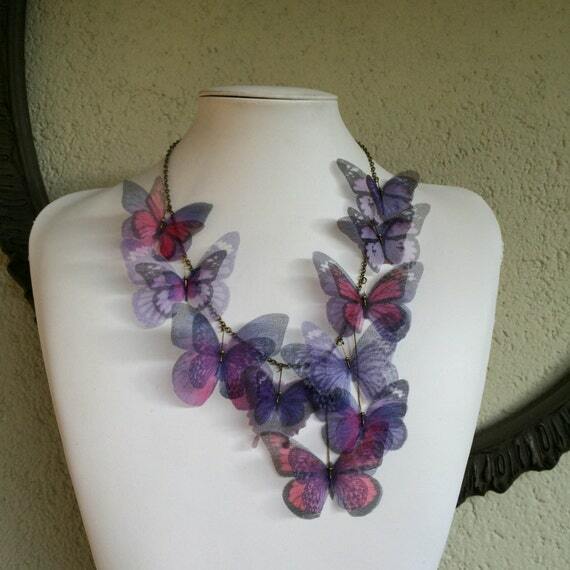 Completely hand-made necklace, with silk organza butterflies. I chose butterfly images one by one, from real pictures and vintage illustrations. Then I printed them on high quality silk organza, cut, sealed to prevent fabric frying and fixed on antique bronze chain. There are 21 butterflies on this necklace, and each one measure from 3 to 8 cm. Antique bronze chain is long about 45 cm. (18 inches). Lobster clasp. 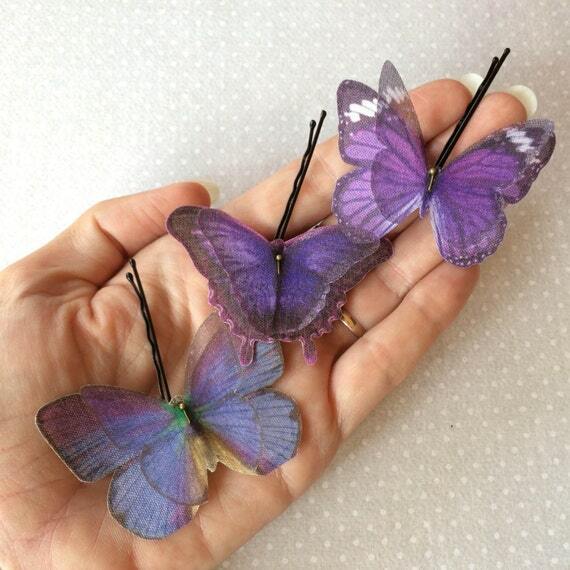 Lovely hand-made bobby pins with Lilac / Violet / Purple butterflies. 3 pieces. I chose butterfly images one by one, from real pictures and vintage illustrations. Then I printed them on high quality silk and silk organza, cut, sealed and fixed using antique bronze findings.